Potted Chicken - home cooked food delivered. 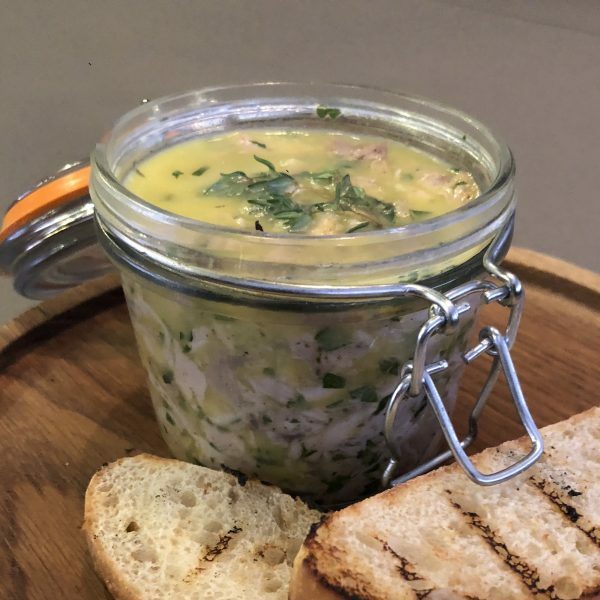 A twist on the classic potted shrimp. The addition of nutmeg and cayenne makes this a great way to start your meal or even to take on a summer picnic. Chicken, unsalted butter (MILK), bay leaves, fresh thyme leaves, lemon zest and juice, cayenne pepper, nutmeg, flat leaf parsley, seasoning. Simply bring to room temperature and tuck in, with some crusty bread! Keep refrigerated and use with 7 days. Once butter seal is broken use within 3 days.